My research into Ambassador Spock's papers has painted an entirely new picture of the years of the Federation now known as Kirk's years. We had never previously understood the relationship between the crew of the Enterprise. They, against all precedence, served together for almost twenty years. The Kirk and Spock revealed in these papers were very brilliant, very dangerous, very driven, and capable of an emotionally intimate relationship that we all could envy. Kirk was a man who fought his pain and his demons to do the right thing. He had hidden abilities and secrets that ate at him. He was capable of extreme cruelty, knew that, and fought against it. He knew he was handsome and considered it a tool. He was by preference a heterosexual. Women were never a substitute and the multiple tell-all books released after his disappearance seemed to document his reputation for being very sexually active, and in demand, as being well-deserved. He knew that women enjoyed him and hungered for him. He seemed to have little ego about it. He was almost eerily accurate with his hunches, to the point where many suspected he was hiding something. Spock was an emotionally crippled, isolative, genius, with little ability to connect with anyone. He had been subjected to blatant racism on both worlds, human and Vulcan. His father continued to make him feel inadequate, and he felt he was a disappointment to his Mother. He considered himself to be ugly, and inadequate. When we first begin to read his journals, he describes himself as asexual because of his lack of desire for intimacy of any type. Vulcans are attracted to the essence of a person which they are able to discern secondary to their telepathy, and are predominantly bisexual.The main reason children are bonded during childhood is to assure m/f relationships and to decrease the violence that historically came out of unbonded males. The bond controls and allows the male to dissipate his emotional load. Without a bond, Vulcan males tend to become unstable with age. It is a fact no-one outside of Vulcan was allowed access to until recently. If he had been asked to vote, Spock would have voted that he preferred women. But he had never found anyone who understood and accepted him without wanting him to be more human, or more Vulcan. He lived for many years feeling life was meant to survive and did not think he would ever be cared for, for himself. His only joy was in science and he pursued it with an obsessive passion. When Spock met Kirk he finally felt the first stirrings of emotional attachment. Over time, Spock discovered total acceptance and grew into someone wonderful. For the first time in his life who he was, was just fine. But the twist was, for the first time Kirk also found acceptance for who he was. He was a super-achiever, controlling, extremely emotional, violent, did not allow himself any weaknesses, and was sometimes brooding. Spock accepted him as he was and pledged his loyalty to Kirk the man, not the looks, not the chance for glory, not the chance for promotion, just the chance to be with Kirk. Everything I discovered in my readings supports this veiwpoint. They became each other's security blankets, brothers, mentors, and more. But it took time and lots of effort to bridge their own barriers and cultural misunderstandings. WARNING: SOME STORIES ARE MARKED [NC17] FOR ADULT CONTENT. YOU MUST BE 18YEARS OLD OR OLDER TO BE ON THIS PAGE. Best K/S 1998: The Vigil Series. The Vigil:Spock, [NC17][K/S] , Spock thinks of his Captain. The Vigil: Kirk, [NC17][K/S] , Kirk thinks about his First Officer. The Vigil: Uhura, [NC17][K/S] , Uhura wants the best for them both. The Vigil:Chorus, [NC17][K/S] , They all want to know the answer. The Vigil's End, [NC17][K/S] , Peace, of a sort. A Man of His Word, [PG13], Who are you, if you are not...? Thank-you to the readers of ASC who voted "A Man Of His Word" as the best TOS General Story of 1998. I am honored. These tales surfaced recently. They were encoded and took the combined efforts of three departments to unlock them. They seem to tell about the strange time between the first Five Year Voyage of the Enterprise and the arrival of V'Ger. I state that they seem to tell the story, because they include multiple tales from Vulcan about Ambassador Sarek, Lady Amanda,Lady T'Pau and the Ruler of Gol, T'Par. They also include some very frightening references to a conspiracy that spans an unbelievable amount of time. I include the tales for completeness sake. I must defer judgement for now on their veracity. These are the TALES FROM GOL. These histories are taken from the years after V'Ger and before the mysterious happenings on the Genesis Planet. A Higher Duty, [PG], There are times in life when your choices are bound by duty. To Run With The Drunnem, [PG], Is Running finally the right choice for James Kirk? The Awakening, [PG], This history was found as two almost identical stories detailing the events on Seraphe. 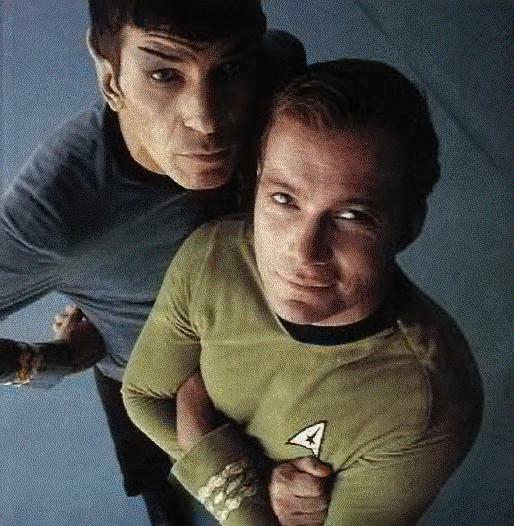 This one details a relationship of the closest of friends/brothers between Admiral Kirk and Ambassador Spock. The Awakening, [NC17], This version implies a much more intimate relationship between the two men. This historian realizes that there is still much speculation regarding the nature of their relationship. Their usual response was: "The nature of our relationship is...our business." These Histories detail the days and years after the disappearance of Admiral Kirk into the Nexus. They end with the final disappearance of Ambassador Spock and the remains of Admiral McCoy. Pictures Of The Mind, [NC17] [K/S] , Spock Remembers. Sweet Dreams And Butterflies, [NC17][K/S] , McCoy Remembers. Far Away, [NC17][K/S] , Spock: Never Parted. A Special Pleasure, [PG], Spock remembers. This tale is set after the death of Admiral Kirk and the remarriage of Ambassador Spock.